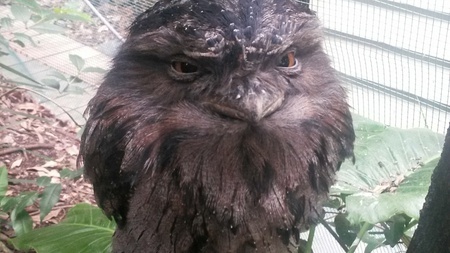 This steely-eyed tawny frogmouth was just one of the cool critters that my boys and I met yesterday at the National Parks wildlife centre at Walkabout Creek at The Gap. Just 12km from the CBD, you can meet birds and snakes and turtles and lizards and more. We got up close and personal with a spotted quoll, a very entertaining wombat, and even a platypus. For under $20 for a family of five, it's a great outing, with a café upstairs afterwards that fed four of us for $40. And a number of bushwalks start nearby. Highly recommended. Find out more at www.walkaboutcreek.com.au/wildlife.aspx. That does sound a bargain price to bring kids and animals together.